We offer community acupuncture in an open healing space on by appointment only. Sessions are provided on zero gravity recliners. We are committed to providing affordable and effective acupuncture treatments in a comfortable group setting. Treating patients in a community setting has many benefits: it’s easy for friends and family members to come in for treatment together; many patients find it comforting; and a collective energetic field of healing becomes established which actually makes individual treatments more powerful. ​Please wear comfortable clothing. We use a style of acupuncture which allows us to only need access to your feet and legs up to the knee, and your hands and arms up to the elbow – so your clothing will need to allow us access to those parts of your body. Please do not wear tight pants or stockings. Pants are fine as long as they can go up to your knee. Please don’t wear strong scents like perfume or cologne. Some people are either allergic or will have a hard time relaxing around these fragrances. After completing paperwork (or bring), you will have a consultation and evaluation in a private room. 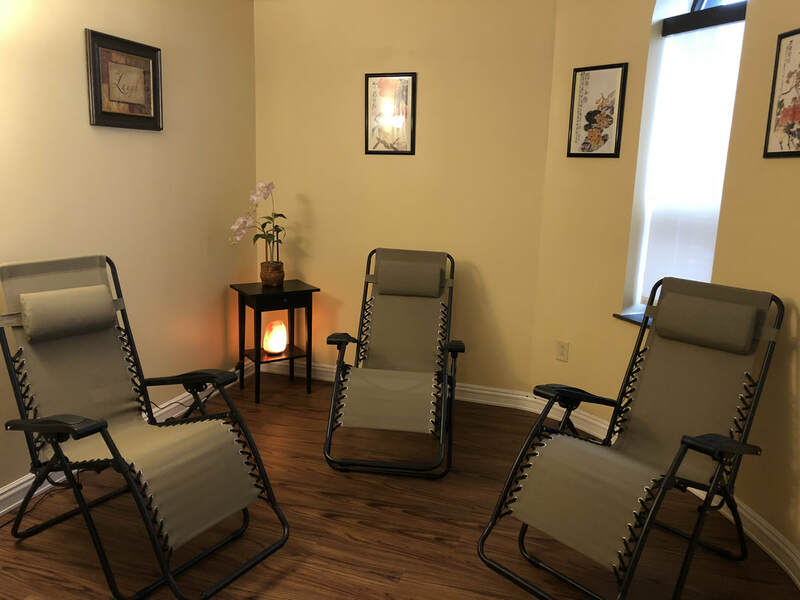 You will walk into the warm and inviting treatment space. After getting comfortable in your super comfy zero gravity recliner your acupuncturist will join you and get started with your treatment. Others will be resting nearby in their own comfortable reclining chair while their treatment is in progress. Serenity is easily accomplished with hushed voices. Clients remain fully dressed; we need only to reach your lower legs, arms, head and neck to be able to offer a treatment. For returning patients our friendly and knowledgeable acupuncturists will sit with you for a few minutes to ask a couple questions, hear about your goals to determine the best treatment plan for you. You acupuncturist will insert between 3-12 sterile hair-thin needles into various points on your legs, feet, arms, hands, ears or head. As your progress changes new goals may be arise. If there are issues that arise and are very personal, please let the receptionist know, the acupuncturist will then be able to speak in a private space. Patients often report that they leave already feeling differently than they did when they first came in. Most patients walk out the door treatment feeling relaxed and recharged. Over time patients are able to report what changes they have noticed. Often the treatments provide subtle changes in areas that may not have been the reason for coming – these “side effects” [improved sleep, reduced stress levels, improved immunity] are a welcome surprise. So as progress occurs, you can see why goals change. The effectiveness of your treatments will increase with frequency. Your initial treatments will only “hold” for 24-72 hours; your next visit will carry you a bit further. Bear in mind, it’s better to come sooner than later to get the best results!